We Ask an Expert: Why Does Omaha Need a Streetcar? Eric Miller grew up in Omaha, went to UNL for his undergraduate degree, and his parents live in Bellevue. But as someone interested in urban planning, and specifically rail transit, he had to move to another city to get his graduate degree and work in the industry. So for the last 14 years, Eric has lived in Denver. He currently works as a senior rail operations analyst for a large engineering firm that specializes in passenger rail. He’s not only a rail transit expert, he uses Denver’s public transportation system every day. “I can’t remember the last time I drove to work,” he said. 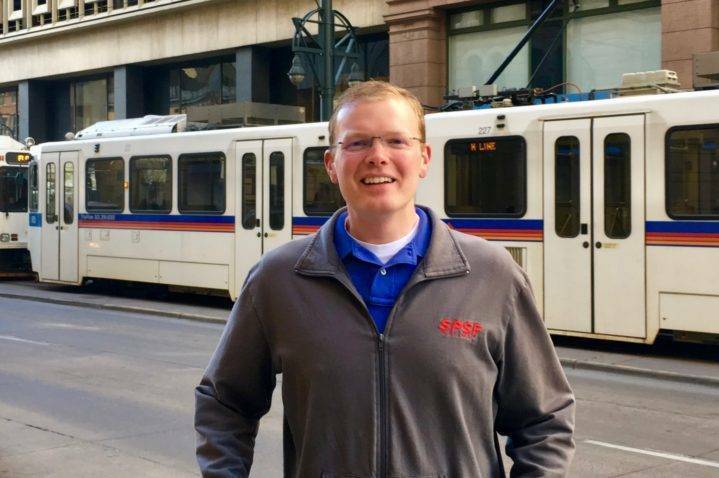 Eric still keeps tabs on his hometown, and he offered his expertise to Modern Streetcar Advocates as to why Omaha needs a streetcar. 1. Omaha needs to keep up with other cities. “World-class cities make it easy for people to get around,” Eric said. These are the cities attracting people and businesses. As cities grow and add density, they need an efficient way of getting people from place to place. 2. Omaha needs more mobility options. “A streetcar is a piece of a complete transportation network,” he said. For some people, it’s the first step to becoming comfortable with public transportation or with rail transit. Streetcars can support future density. Like the bus circulator serves the College World Series crowd, that type of efficient, fast public transportation can fuel future growth to keep up with the increased demand every day. In addition, streetcars can help define a city. “Rail transit – like streetcars – provides a better sense of place than cars,” Eric said. A streetcar in Omaha can serve our growing population, engage future residents and represent forward-thinking culture.